Newly released in December 2015, the Field Guide presents current, science-based information on all aspects of disease, weed, and pest and beneficial arthropod identification, biology, and management in a style intended for growers, consultants, and other field personnel. Over 200 color photos are provided throughout the book to aid in identification and diagnosis. Development of the Field Guide was a collaborative effort of USDA Agricultural Research Service, Oregon State University, University of Idaho, Washington State University, Michigan State, and several other institutions across the country in response to the U.S. hop industry's need for IPM information in a package more readily applied by producers. Funding for this publication was provided by the Western IPM Center and Brewers Association. 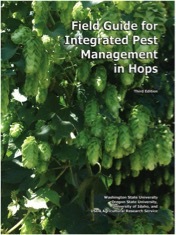 The Pocket Version of the Field Guide for Integrated Pest Management in Hops was developed in 2009, and contains images of the primary pests, diseases, and beneficial organisms associated with hops in the U.S. Development of the field guide was a collaborative effort of USDA Agricultural Research Service, Oregon State University, University of Idaho, and Washington State University in response to the U.S. hop industry's need for IPM information in a package more readily usable by producers and their field personnel. Funding for this publication was provided by the EPA Pesticide Environmental Stewardship Program.